Good grief, it’s another huge week for the podcast, although this one comes in at just under 40 minutes. The lineup includes Beasts Of Burden #1, Blackest Night: Superman #2, Detective Comics #857, Fantastic Four #571, Final Crisis Aftermath: Dance #5, Galactica 1980 #1, Justice League of America #37, Madame Xanadu #15, The Simpsons Treehouse Of Horror #15, Supergirl #45, Superman: Secret Origin #1, and Wednesday Comics #12. Music, as always, is by R.E.M. Download it here, stream it via the player on this page, or visit the podcast homepage here. Happy listening! Not a big week this week, thank goodness — just Agents Of Atlas #10, Batman #690, Justice League: Cry For Justice #3, Strange Tales #1, Supergirl Annual #1, and Wednesday Comics #9. As it happens, I’ll be out of pocket next week, so check back in about ten days. Music, as always, by R.E.M. Download it here, listen to it via the player at right, or visit the podcast homepage here. Happy listening! As promised, here’s the podcast for last week’s comics. Specifically, they’re Batman: Streets Of Gotham #3, Blackest Night: Superman #1, The Brave and the Bold #26, Final Crisis Aftermath: Dance #4, Justice League of America #36, Supergirl #44, Superman Annual #14, and Wednesday Comics #7. The embarrassing reference this time out is to Ally McBeal. Music, of course, is by R.E.M. Download it directly here, stream it directly from the player on this here site, or go to the podcast homepage here. This week I go off on a little rant about Mark Millar’s Fantastic Four, and there are references to Fargo and Stripes, as well as a thoroughly-unsurprising Monty Python reference. Otherwise, it’s Batman: The Brave and the Bold #7, Blackest Night: Tales of the Corps #3, Detective Comics #855, Fantastic Four #569, Justice League of America #35, Madame Xanadu #13, Superman #690, Wednesday Comics #4, and Wonder Woman #34. Music, as always, is by R.E.M. Download it here, or go directly to the podcast homepage here. Would You Like Less Pulp In Your JLA? That phrase might not be perfectly accurate, but it’s a good soundbite. Batman has some pulp roots (Zorro, the Shadow). The Flash and the Atom are science-heroes, powered by vaguely plausible experiments/accidents. Green Lantern and Hawkman are space-opera characters. 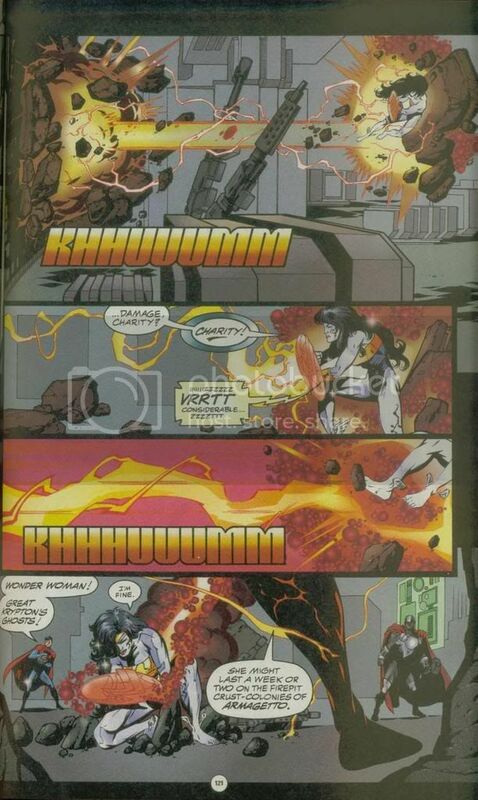 Zatanna straddles the Vertigo line. The Elongated Man and the Martian Manhunter are different types of detectives; and at one point Booster Gold and Captain Atom were different kinds of “men out of time.” The ones I would call “pure” superheroes — for purposes of this post, “fantasy” characters — include Aquaman, Superman, and Wonder Woman. Therefore, I think it would be instructive to examine which Leaguers tend to fare the best over the years. If the Justice League is a sampler of DC as a whole, seeing which “genre” dominates its adventures might give us a clue as to the company’s overall tone. Regardless, I suspect that, despite J’Onn J’Onzz’s presence in virtually every era of the team, Batman would be the go-to guy. Batman always has a plan; Batman always wins. Grant Morrison had Batman unmask the Hyperclan (and beat up three of them), outlast DeSaad, and outsmart Lex Luthor. When he wanted to show that Prometheus meant business, he had the new villain (who was an “evil Batman”) first defeat the Darknight Detective. It goes back farther. One could argue that Batman leaving the League and founding the Outsiders was the beginning of the “Satellite Era’s” end. Likewise, Batman’s return to the team (now based in Detroit) was an attempt to lend that League some credibility. Batman was a dominant force in the early Giffen/DeMatteis years, and showed up a few times in the Dan Jurgens/Gerard Jones/Ron Randall relaunches of the early ’90s. And why do people like Batman? Because he has no powers but he’s real smart. (Also, the years of martial-arts training and discipline don’t hurt.) So what does it say that, on a team composed of characters from different genres, that the most visible heir of the pulp heroes routinely gets the most deference? Clearly the implication is that Batman represents the “need for realism” which has driven superhero comics for the past twenty-plus years (probably going back to his takedown of Superman in The Dark Knight Falls). Yes, those who look to Batman for “realism” are probably frustrated with his very involvement in the Justice League, but I don’t see too many people claiming that Black Canary and Green Arrow are any more realistic. Indeed (despite GA’s appearance in the Dark Knight Superman fight), conventional fan wisdom seems to hold that a bow and trick arrows are no way to stop, say, the Demons Three, or even a moderately well-armed super-criminal like Captain Cold. Actually, now that I think about it, Kingdom Come also gave Batman’s “talented-humans” team something of an advantage, in that they didn’t have the drama of Superman’s and Wonder Woman’s Justice League. 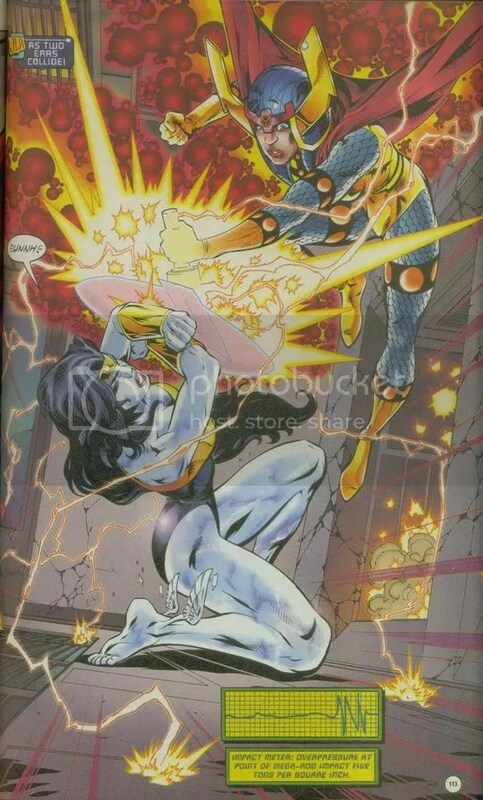 With that nuclear strike, the “regular” humans also end up settling much of the superheroes’ infighting. So what are we to make of this trend? Is it an anti-superpower bias? (Ozymandias even beats Doctor Manhattan, at least for a minute or so.) Or is it simply more interesting to have the non-powered, real-smart humans outsmarting the powerhouses? Still, what’s the point of having a Justice League if you’re not going to use the Supermen and Wonder Women? Well, in fact, the JLI teams got along pretty well with only a few powerhouses at a time (Martian Manhunter, Doctor Fate, Captain Atom, Captain Marvel). Guy Gardner was never really a world-beater as a Green Lantern, Wally West was stuck at the speed of sound for much of his JLI tenure, and Power Girl was de-powered as well. 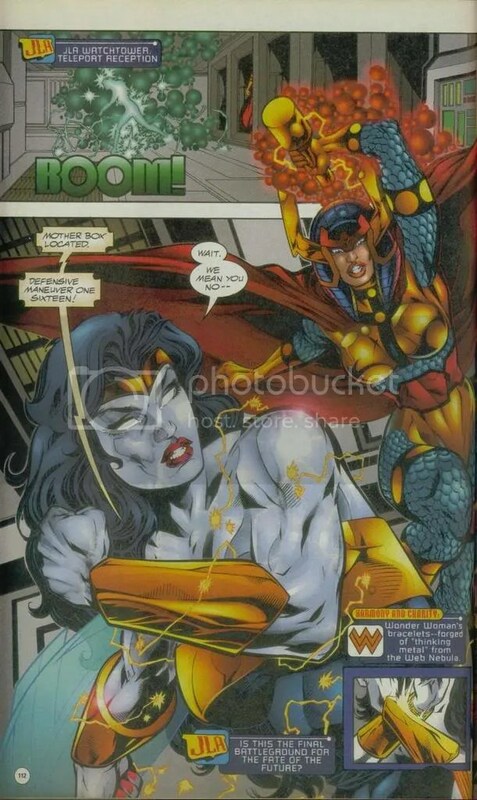 Even when the Morrison League brought together the “big guns” (for the first time in that continuity), Morrison tended to place the powerhouses in set pieces: Superman wrestling the angel, Big Barda fighting the future Wonder Woman, Green Lantern containing an exploding Sun. Morrison’s Flash and Green Lantern were especially creatures of the Id; whereas the lower-powered characters (Huntress, Steel, Green Arrow II, and of course Batman) got to be smart. “R.I.P.” conclusion a pass. Batman should be a world-beater, you know? However, there are times when he should also be surrounded by world-beaters, even taking a back seat to them once in a while. If these are superhero stories, pulp’s most famous heir shouldn’t be hogging the stage. 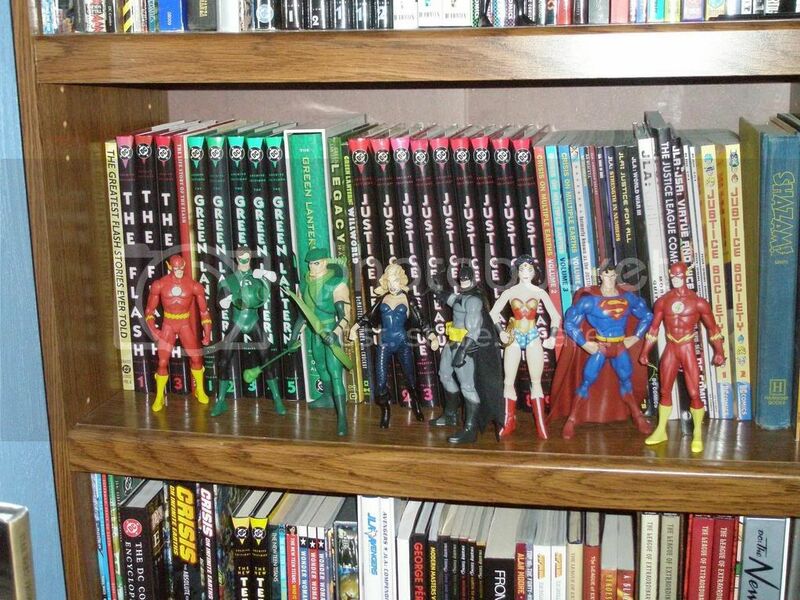 Everyone remember the Justice League bookshelf? Wouldn’t ‘cha know, the Green Lantern figure has suffered a career-ending knee injury, and I’ll be needing a new one. However, thanks to the good folks at Mattel, I now have a choice. Do I replace the “Hard Traveling” Hal, thereby keeping that set of Hal/Ollie/Dinah intact; or do I go for the more articulated Mattel version? (If it makes a difference, I am planning to get a Mattel Aquaman as well at some point.) 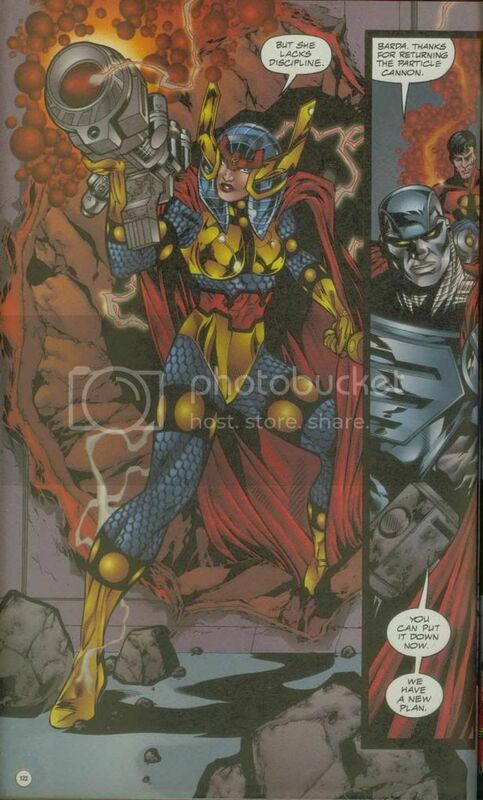 I don’t think availability is an issue, since I got both Ollie and Dinah off teh Ebay.